I Will Never Grow Up Threat Level (aka "Hit or Miss") Dice are designed for use with any game that requires rolling any number or more/less! 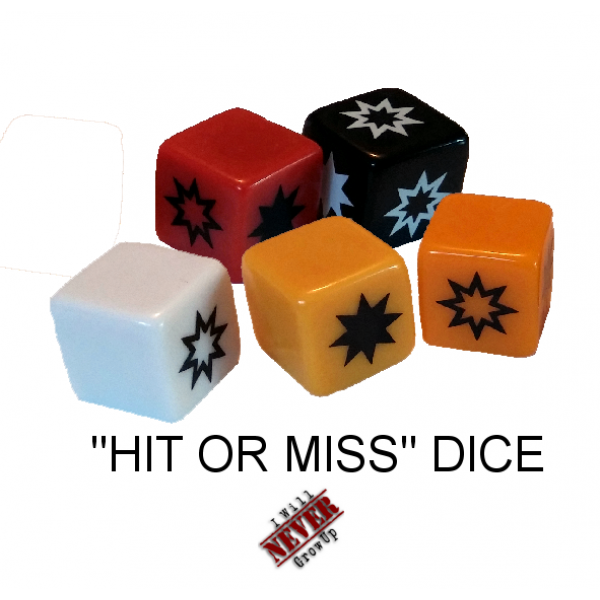 Miniature War gamers, Historical War gamers and MORE can benefit from the speed these dice add to their games! Designed with an increasing threat level color code (White > Yellow > Orange > Red > Black) to represent the added chances of rolling a hit as you move up the threat level! Do you need to roll a combat that includes 2 units that hit on 2 or higher, 3 hit on 4 or higher and 1 hits on 5 or higher? Sure, you could roll all three of those types of units separately, but with Threat Level Dice you can just grab the appropriate number and color of dice and roll it all at once. Then, just add up the hit symbols and you're done! 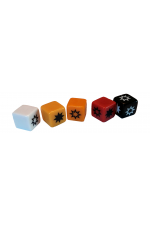 Speed up your games with I Will Never Grow Up "THREAT LEVEL" Dice!